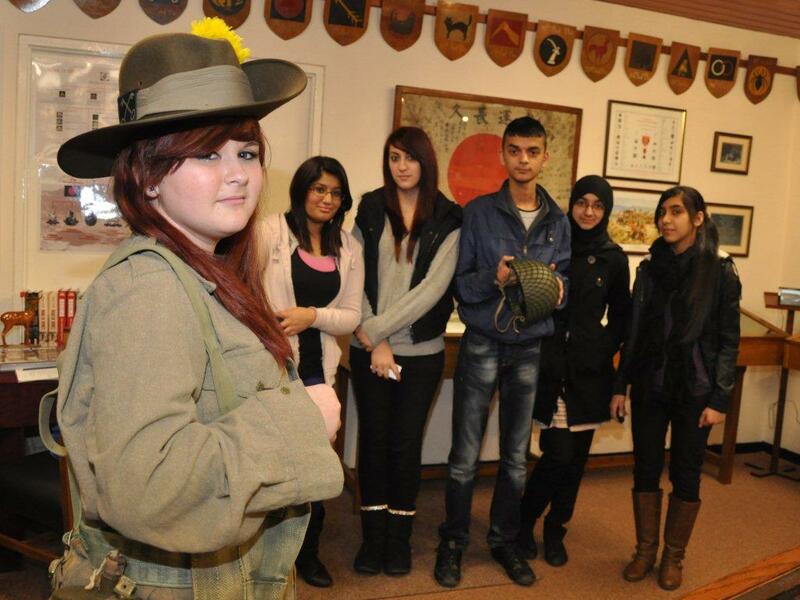 A dozen Year 10 pupils from Laisterdyke Business and Enterprise College in Bradford have visited a World War II museum in York to discover more about their ancestors. Pupil Sarah Wright (15) models a British military uniform from the 1940s to other students from Laisterdyke Business and Enterprise College in Bradford. 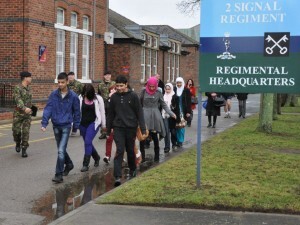 The Kohima Museum, based in Imphal Barracks, Fulford, York commemorates the deeds and actions of the British 2nd Division from 1942 – 1946 paying particular attention to the Siege and Battle of Kohima. It hosts a vast selection of memorabilia from the event including war diaries, uniforms, medals, maps, charts, ground photographs and weapons. 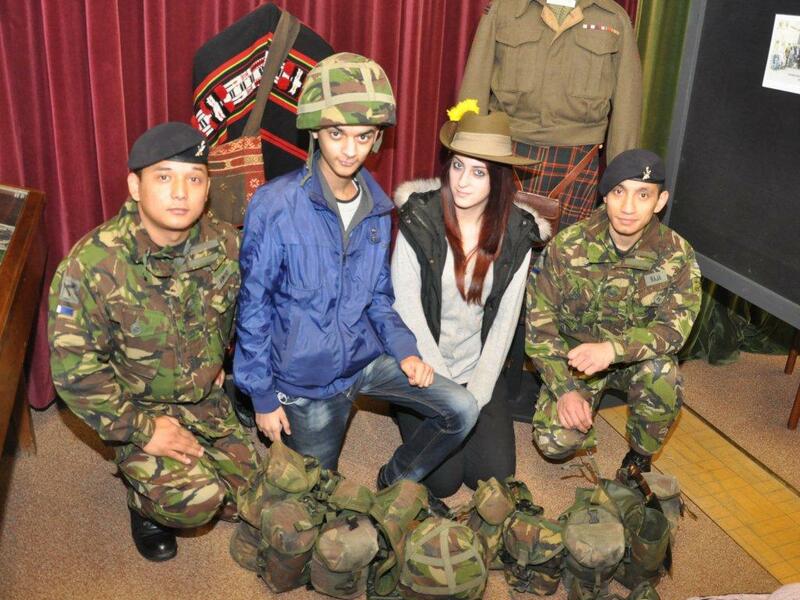 The students witnessed the visual differences in warfare between 1942 and 2012 by examining different artefacts, and speaking to Gurkha soldiers from 2 Signal Regiment about their modern day experiences. 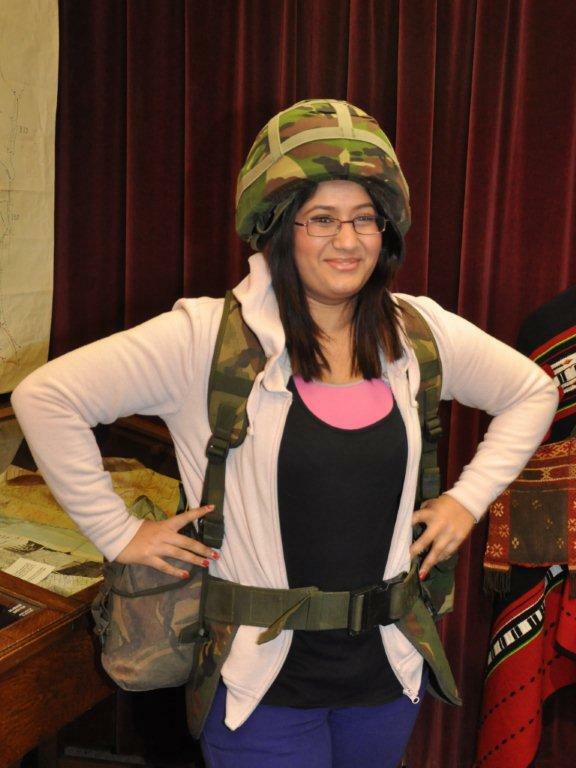 They also had the opportunity to model military dress from the different periods, and discover what life was like for an every day soldier by marching across the barracks to the Kohima Restaurant to sample what the military of today eat in the battle field. Owais Masood (15) and Awais Ahmed (14) lead the march around Imphal Barracks, York. 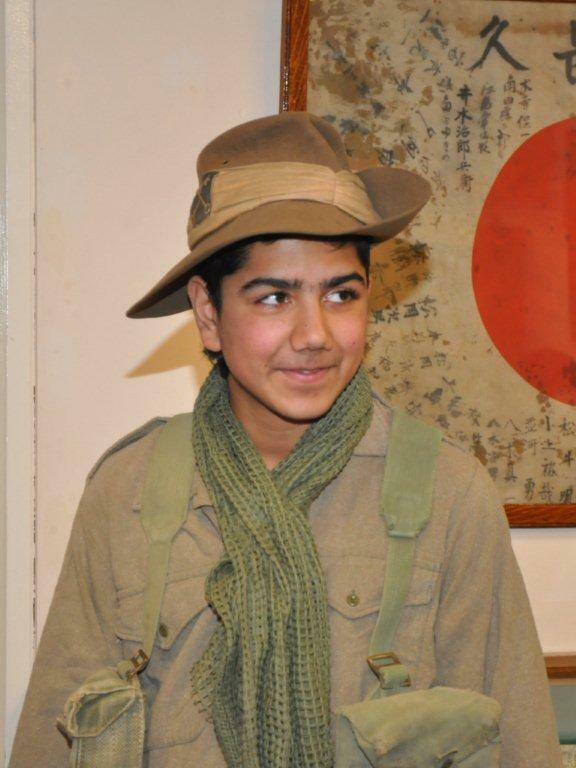 “It’s very important for these teenagers to find out more about their shared history, especially their military history where some of their Great Grandfathers would have taken part in the Battle of Kohima, preventing the Japanese invasion into India. They need to realise that although we live in England, their ancestors equally took part in the battles of the Second World War along with other countries. 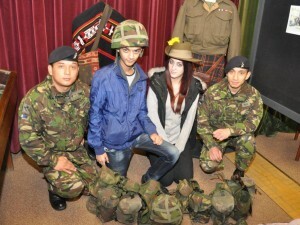 Pupils Owais Masood (15) and Becky Keaney (15) try on the kit with Ghurkha soldiers from 2 Signal Regiment. The school visit was co-ordinated as part of the Prince of Wales’ Mosaic Mentoring programme, which inspires young people from deprived communities to realise their talents and potential. The programme links young people with inspirational role models to boost their confidence, self-efficacy and long-term employability. Gerard Liston and some of his students. Awais Ahmed (14) looking well hard! Right you lot! Get fell in! 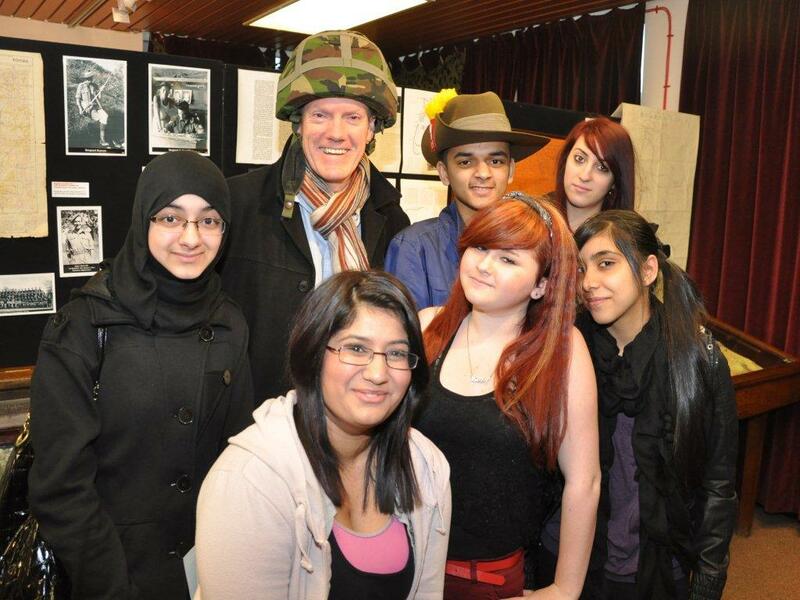 The College then went on to visit the “We Were There” exhibition at Kala Sangam, Bradford which highlights the contribution made by the people of Asia, Africa and the West Indies to the defence of Britain going back 250 years. This entry was posted in News and tagged Kohima Museum, School visit, York by Bob Cook. Bookmark the permalink.